Remember I asked you guys before for some fashion challenges? Since now I can fit into my old clothes I've decided to start doing these challenges and answering your fashion questions as well. Katrina's fashion challenge was to see me in mismatched prints from head to toe. So here's my take to that challenge. Wore my tie-dye top with my new mesh floral mini skirt (a gift from my dear husband). I was running late this morning and I can't find my printed shoes, so plain black clogs will have to do. I suppose I failed this challenge coz I didn't wear mismatched prints from head to toe... I think I need redo this challenge again eh? I learned this the hard way. Steer clear of loose tent like clothing! They make you look 10x bigger! My eyes are still adjusting; no more baby bump! you look super cute! i love the star-like print on the shirt! parang it's glowing! haha! well said Lloyda...you look super cute in your outfit...especially the skirt...is beautiful!!! Check out my Forever21 giveaway...you might want to join the fun! beautiful outfit! 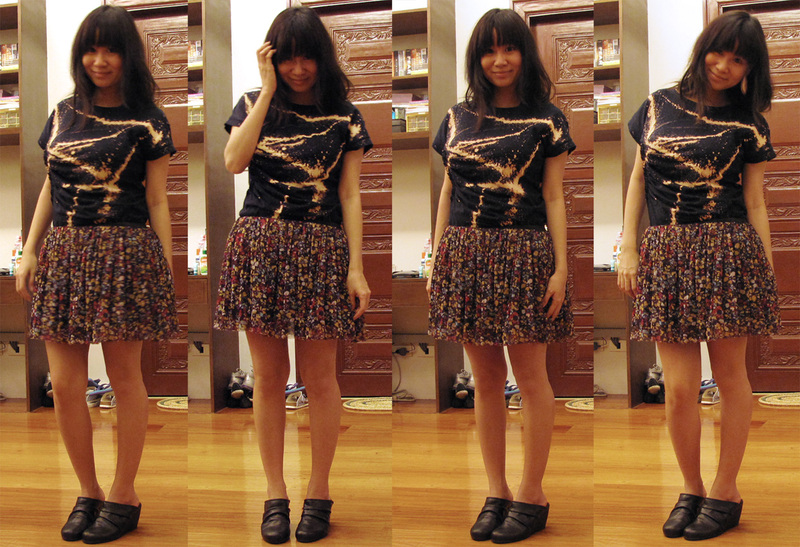 i love mismatched prints, for some reason, i have hardly any block colours in my wardrobe. hahaha all prints! i love the skirt! you rock that mismatched look! ;D beautiful!